eBay is incredible, isn't it? 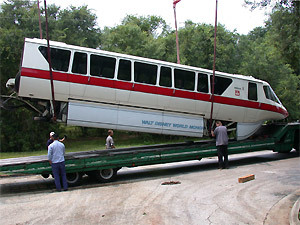 Who would have thought that the Disney Company would actually put one of their old Mark IV monorail cabs up for sale via online auction? Well, they did on May 27, 2002. 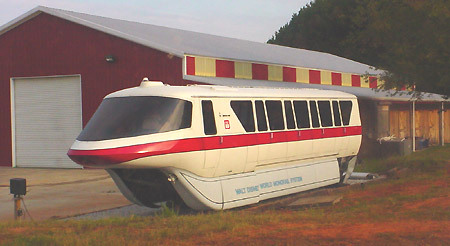 Now to a monorail fan, or a Disney fan, this has got to be the ultimate souvenir from Walt Disney World. The auction got the attention of enthusiasts as well as the press from all over the world. Bids came in hot and heavy right up to the closing minutes. Wait a second folks, read the fine print. Turns out that only the nose cone was being sold. Dimensions were included to show what the winner would get. Hey, I could find space for this! Sorry, no such luck this time. 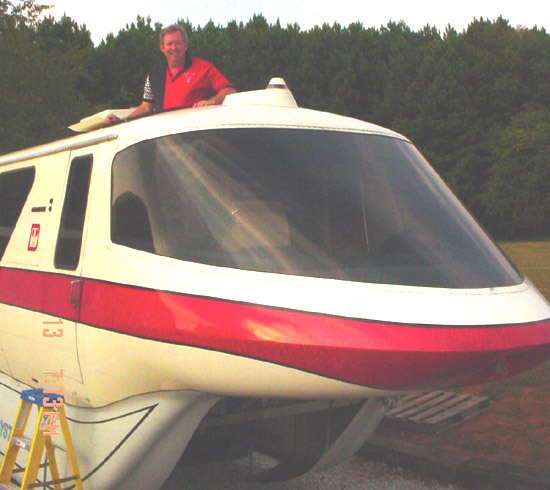 The winner on June 6, 2002 was Chip Young of Georgia. 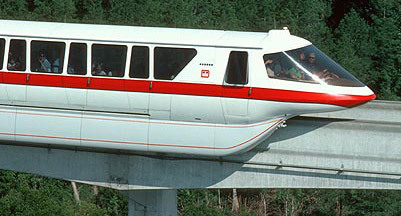 On his victory, Chip honored us by joining the Monorail Society on the very same day! Winning bid? Hold onto your hats...$20,000 plus shipping expenses. Now friends, that is a real collector! 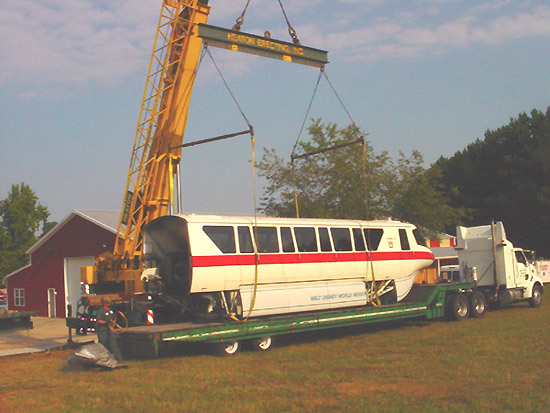 Logistics were worked out between Disney and Chip and within a few months Monorail Red was loaded onto a truck bed for delivery. Hey, looky there...he gets the whole car after all! Way to go!! 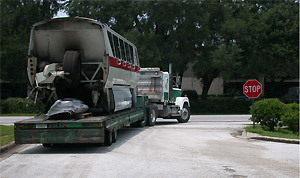 After dutifully serving at Walt Disney World with millions of miles and passengers, Mark IV Red leaves Florida for the journey to Georgia. And here we are at Chip's place. Don't we all wish this was our yard? Looks great, huh? What do ya know, it even matchs the barn. And finally, here's the new owner poking his head through the emergency door of the cab. When is the TMS Georgia BBQ taking place buddy? Our congratulations to Chip for obtaining the ultimate monorail collectible!